I’m a recipe tinker-er. If I find a recipe I want to try and it doesn’t work, I’ll tinker with it until it does. So, this recipe comes from a desire for perfect white bread. I’m a huge fan of what King Arthur Flour does, but their recipes don’t always come out quite right. Plus I’m what you’d call an expert baker, since nothing with yeast intimidates me. As you’ve seen on our social channels I bake everything from Japanese pastries to baking bismarks…so a basic loaf of bread is a no-brainer. While we rarely buy bread beyond sourdough as I’ve yet to find a starter that I love (I’ve read that making one with grapes is best, but I’ve yet to tackle that). Last week, while going through some of my very old cookbooks I even found recipes to make my yeast from scratch using potatoes. I’m totally going to be trying that soon, regardless of how inexpensive yeast is I just like to do things myself. Back to baking bread, it’s not uncommon for me to make a loaf of bread on a day when we’re home. Since it only takes a few hours and if you use a bread machine to mix, knead and proof your dough making bread could not be easier. More than 5 years ago I was given a bread machine, it’s an inexpensive model that I would never bake my bread in, but makes mixing easy. Can I make my bread without it? Of course, but using the bread machine also creates less mess and guarantees that my bread will fit into my time schedule. I turn to baking authorities like King Arthur Flour or America’s Test Kitchen when I want a recipe that should work the first time. Typically they bake up beautifully, but this recipe was lacking shape and could use a bit more structure. 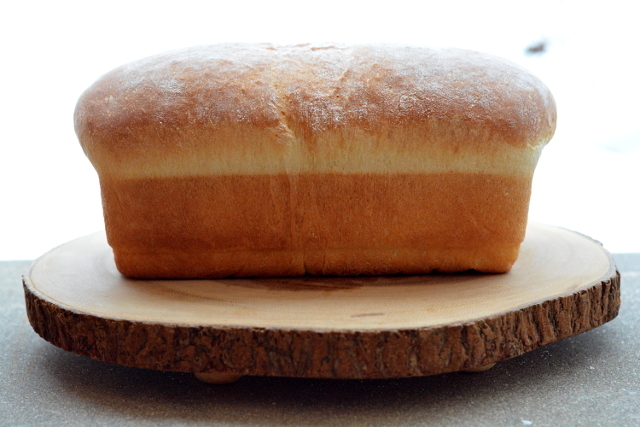 With a couple of changes, we can create a beautiful loaf of sandwich bread. I’ve switched from water to 110-120 degree whole milk, changed the honey to sugar and increased the amount, and I’ve added an egg yolk to give the bread a little more structure and richness. White bread is something that makes great sandwiches, but this bread will hold up to any toppings. We’ve all had the white bread that sticks to the roof of your mouth, this isn’t that sad bread. This loaf will slice up evenly without falling apart. Finally, I hope you’ll give this a try and let me know what you think. 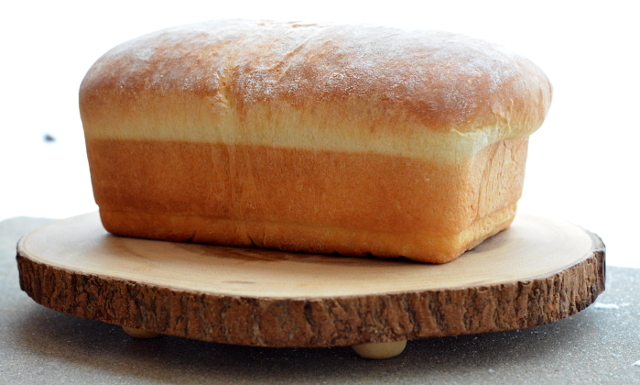 A loaf of white bread that is simple but won't disappoint you. This is no weak bread, but the perfect sandwich bread. Add ingredients in order listed or per your bread machines instructions and set to the dough cycle. This will mix, knead and proof your dough through the first rise. In the bowl of a stand mixer fitted with a dough hook combine: milk, butter, egg yolk, sugar and yeast. A cup at time add flour mixed with salt until a cohesive dough forms. At this time you can let the machine "knead" your dough for 5 minutes or you can knead dough yourself on a flat surface dusted with flour as needed until dough is smooth and elastic. Place dough in a well greased large bowl or container, cover and let rise till double at least 1 hour. 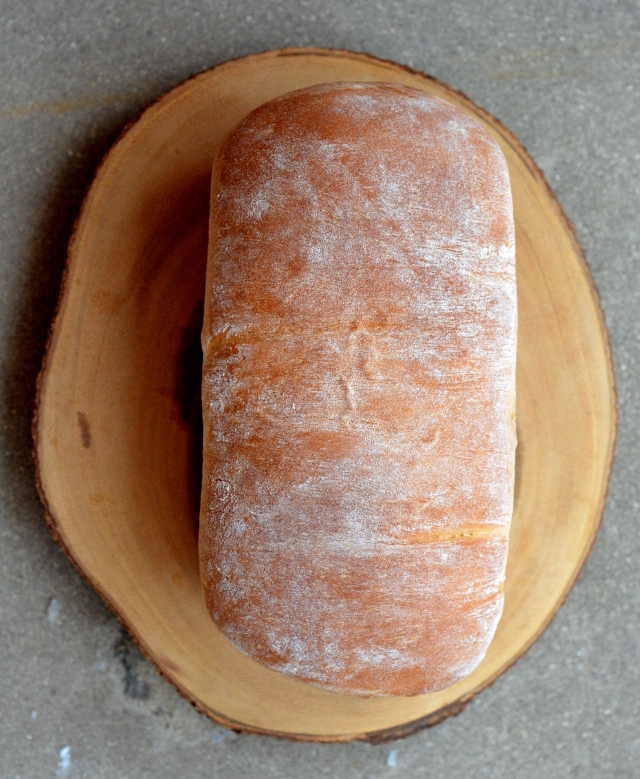 Deflate dough, and shape it into a 9-inch log and place it in a greased 9 X 5- inch loaf pan. Cover the pan and let dough rise again until it reaches 1 inch above the pan. This should take an 1 -1/2 hours. Preheat oven to 350 degrees, bake 20 minutes uncovered. Check at this point and if your loaf is golden enough, tent with aluminum foil. Bake another 5-10 minutes until loaf reaches 190 degrees. Remove from oven and immediately turn out onto a rack to cool. The total time will vary on how quickly your bread proves.